Hello everyone! 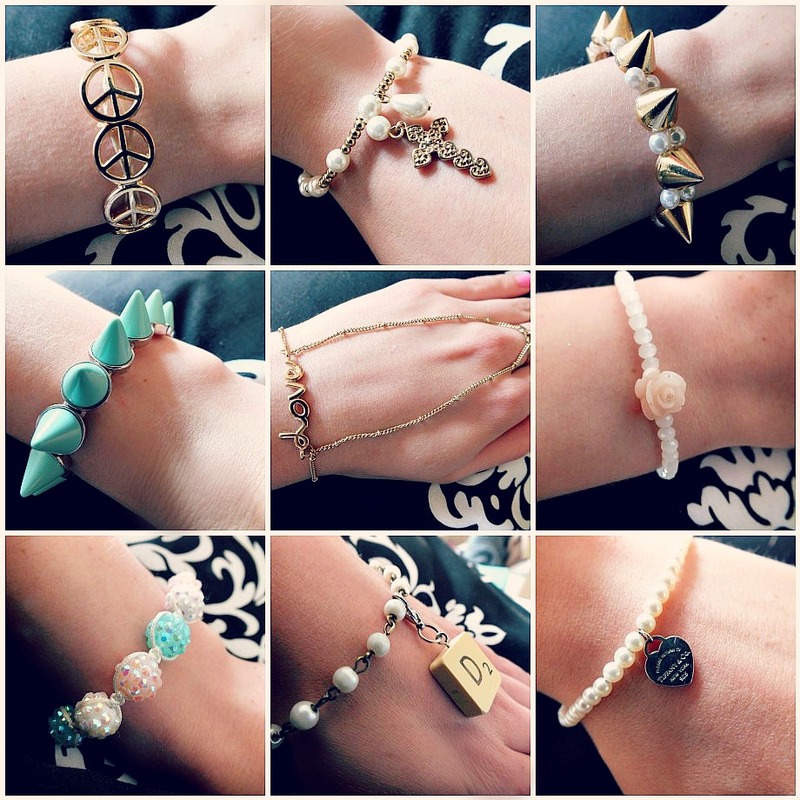 It's time for another jewellery favourites post! I quite enjoy doing these and going through all my jewellery, it was actually pretty hard to choose for this post as I have a lot of lovely bracelets but I managed to narrow it down to my top 9! The first is one that I wear a LOT, it's so pretty and I love peace signs, it's quite simple and even though it looks very cute on it's own its also great to layer with other bracelets. The next two are ones that it would be great to layer with! I love the gold and pearl colours on these, the cross one is gorgeous, it's so detailed! I love how edgy the spike one is, while still remaining pretty with the feminine pearls. The mint spike bracelet is an all time favourite of mine, it's cute and sweet because of the colour but a bit tough because of the spikes! I love this ring/ bracelet from matalan, it's a statement piece without being to crazy and huge, it's simple but it's different and I love that! The rose bracelet from topshop is actually quite old now but it's lasted very well and I love it so much, it's so simple and sweet, it's the perfect bracelet to throw on with most outfits to make it a little more girly. The crystal string bracelet is so cute, it's another one that looks great layered with others. This scrabble bracelet is so cute, it's a D because my boyfriends name is Darren, that might seem a little cheesy but I don't care because I loves him! Lastly, this bracelet from Tiffany's, I got this on holiday in New York last year for my 17th birthday so it means a lot to me! It's so sweet and pretty and I absolutely love pearls! So that's it! Hope you enjoyed, have a great day!